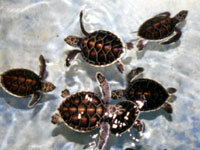 The sea turtles can weigh up to 300 kilograms, and are currently on the endangered species list. While the turtle farm is one of theattractions in Isla Mujeres, it is also a scientific facility where visitors are encouraged to learn more about the animals. Dive into the Caribbean for an adventure in a submarine and explore the underwater world off the coast of Cancun. Submarine tours are growing in popularity, as they allow visitors to see eye-to-eye with many aquatic species without having to pull on a wet suit. Explore the Punta Nizuc Coral Reef part of the Great Mesoamerican Reef located off the south end of Cancun, and watch rainbow-colored parrot fish swim along as giant rays gracefully glide through the crystal clear waters. The Great Mesoamerican Reef extends 450 miles from Punta Nizuc to the Bay of Islands in Honduras and is home to more than 100 species of coral, 164 species of reef dwelling fish and larger sea creatures like sea turtles and dolphins. Some tours in Cancun may have a glass bottom submarine that allow visitors to see the colorful coral reefs and smaller fish that live in them, while others have personal submarines that allow visitors to have a more private and unique interaction with the reef and its inhabitants. 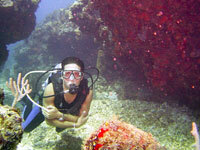 Exploring the underwater terrain will make your vacation to Cancun one that you will never forget. Love the thrill of exploring new areas in unconventional ways? 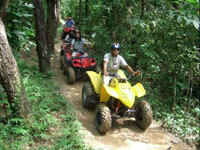 Take an ATV tour in Cancun into the depths of the jungle and see a different side of the Caribbean. Many tour groups offer these wildly fun adventures, where lush forestry whips by the windows of the vehicle as you wind around the areas. With breaks at local attractions such as an interactive zoo, get ready to get up close and personal with the animals that inhabit the beautiful area. Visit Mayan ruins that have been hidden in the forest for centuries - learn about their amazing culture and marvel at the ancient architectural structures that can be found around the area. If you are looking for something a little more hands on, dive into one of the many cenotes. Plunge in to the cool emerald-green water and explore these large natural sinkholes. If you snorkel, throw those flippers on and explore the magnificent limestone formations that may lay under the calm surface of the water. Often the tours in Cancun will come and pick your family up from your hotel or resort and drive around the city, allowing you to fully appreciate the history and culture of the area. Ever wondered what it would be like to see the jungle from a bird's eye view? Take the leap and zip line your way along the jungle canopy. Zip lining in Cancun is starting to become a popular way to see the jungle for those looking for an adrenaline rush and a unique perspective of the lush forestry. The highest platforms tend to be around 130 feet from the jungle floor, allowing for visitors to speed by parrots, monkeys and other exotic jungle animals. Fly past the jungle and you may find yourself close to a cenote, which will allow you to swim and explore the depths of the forests. Enjoy a packed lunch, while basking in the shade of the forest canopy and cool off in the clear waters of the cenote. If you don't want to zip line your way across the higher parts of the forest, take an ATV tour of the jungle floor and wind your way through the trees and vines. So whether zipping through the trees or speeding through the forest floor, your zip line adventure inCancun will make your trip unforgettable. Enjoy the Best Isla Mujeres Day Tour while in Cancun! While spending a great vacation in Cancun, you also have the chance of exploring the beautiful waters of the Caribbean by boat to enjoy Isla Mujeres Attractions. Visitors can take an Isla Mujeres day tour and spend the whole morning exploring everything that the crystal clear sea has to offer. Snorkel in the second largest coral reef in the world, the Mesoamerican reef, after watching the sunrise from the deck of your boat. After spending the day on the crystal clear waters, go back to the dock after watching the sunset turn the clear sky into a veritable watercolor painting of reds and oranges. Many companies may also offer you a choice of Isla Mujeres day trips along with renting out boats that can hold up to 100 people for larger parties, such as weddings or special events. So slather on that sunscreen and get ready to explore and experience the finest that the Mexican Caribbean and Cancun have to offer, Isla Mujeres beaches, tours and much more!